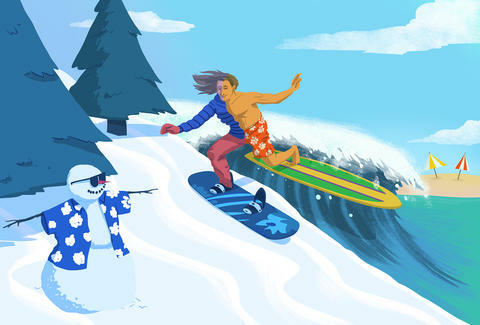 Is It Actually Possible to Go Surfing and Snowboarding in the Same Day? I Found Out. 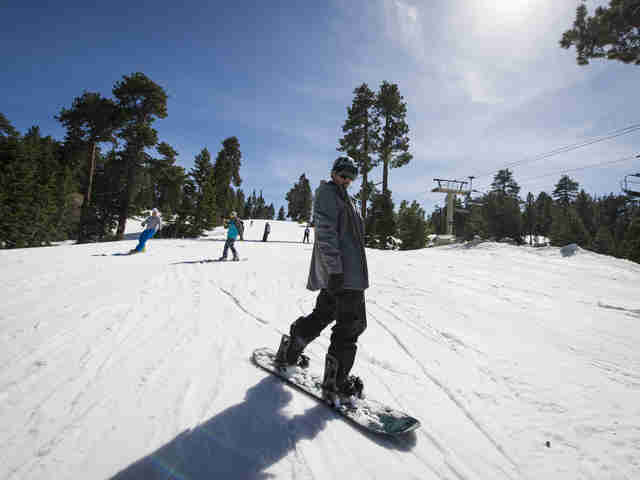 For time immemorial, a lot of people have argued that the ability to go surfing and snowboarding in one day is what makes Southern California so great. But let’s be honest: it’s something a lot of people talk about, but no one’s ever really done. So when the opportunity came up for me to give it a shot... of course I said yes. Well yes, with caveat: I have never surfed before, and the last time I went snowboarding was about 10 years ago. There are few people in the world less equipped to attempt to surf and snowboard in the same day. So, yep, I said yes anyways. Full disclosure: it was actually Chevrolet’s idea -- the company did this with a grip of press people -- and they even secured us a hell of a leader: professional surfer Damien Hobgood. As we gathered at Huntington Beach at 6:30am, I quickly realized I was pretty much the only one of us who had never surfed before. Nailed it! After I attempted to absorb a quick lesson from the dudes of Endless Summer Surf Camp (they were great, but by the end I definitely felt like Jason Segel in Forgetting Sarah Marshall), we set off to catch some waves. Here’s the thing about surfing: ohmygod surfing is so hard. I definitely assumed that the actual surfing part of surfing would be the hardest. But, nope, it’s the paddling. By the time I had paddled my way across the waves to the spot where I was supposed to pop up, my arms felt like they were going to fall off. And, look -- NOT TRYNA BRAG, but at one point I totally got one foot on the board before I wiped out for the billionth time. What can I say? I’m a natural athlete. After a couple hours of wiping out while Damien completely ripped it across every wave, we packed up our gear and got into our cars -- next stop: Big Bear. We loaded up our gear into a fleet of 2016 Colorados, and departed from Huntington around 11am. Then we made our way to Snow Summit (big shout out to the in-car WiFi, which allowed me to complete a future Thrillist assignment on the way up... 2016 is nuts.) to “crush some powder” or “shred the gnar” or whatever people that snowboard call it. It was completely unique and pretty special to watch the scenery change from city life and ocean air, to tall pine trees and mountain air. There’s not a lot of places where you can get this type of experience in such a short distance -- sure, the rest of California has mountains and beaches, but none as beautiful and picturesque as the beaches in Southern California. And certainly none only two to three hours from the snow. Further proving the point that this whole thing IS possible, we arrived around 2pm -- plenty of time to hit the mountain before it closed at 4pm. Though I hadn't snowboarded in 10 years, I wasn’t nearly as horrible at it as I was at surfing. I certainly wasn’t as good as Damien, or, ya know, any of the small children that went zipping by me, but I did make it to the bottom of the mountain with all my limbs. Again, NOT TRYNA BRAG, but I only fell down a mere 37 hundred times. Sorry ‘bout it. I will admit, it’s safe to say that the reason I’m better at snowboarding is because you get to take a ski lift to the top, unlike surfing where you have to battle the strength of ten thousand armies as you paddle out to sea. If I had to climb the mountain on my stomach before I snowboarded down it, you can bet I’d be a lot more exhausted. I did it, though. I took advantage of one of the most incredible advantages Southern California has to offer. 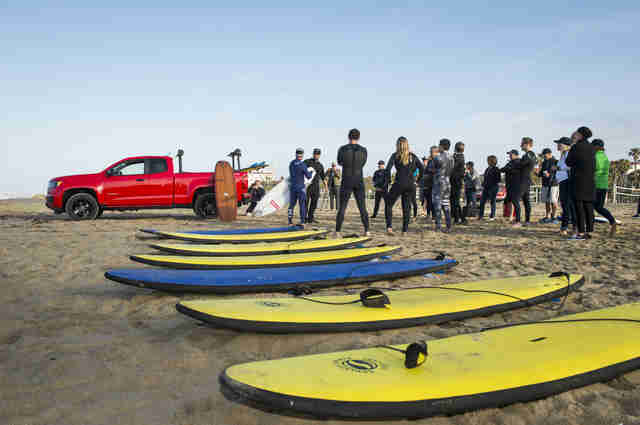 If you’ve got the will, the energy, and yes, a truck that can fit all your gear AND drive through the snow, it is possible to both surf and ski in the same day in LA. Even if you do both incredibly poorly.